Original fast, smooth easy to clean Swiss bearings made for skates! Bones Swiss Labyrinth bearings in 16pack for 8 wheels. Speed Roller or inline race skating. Shielded for cleaner, smoother skating. 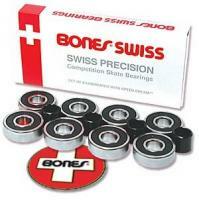 Bones Super Swiss 6 bearings in 16pack. Stronger, faster, longer lasting Swiss made.